Do the words luxurious and laundry seem like they don’t belong together? We bet you’ll change your mind when you see some of the incredible features homeowners are putting in their laundry rooms! The days of hauling a basket of dirty clothes into a dingy basement belong in the past. A well-appointed laundry room not only is a more enjoyable space in which to work, but it can also make this tedious chore a lot easier. 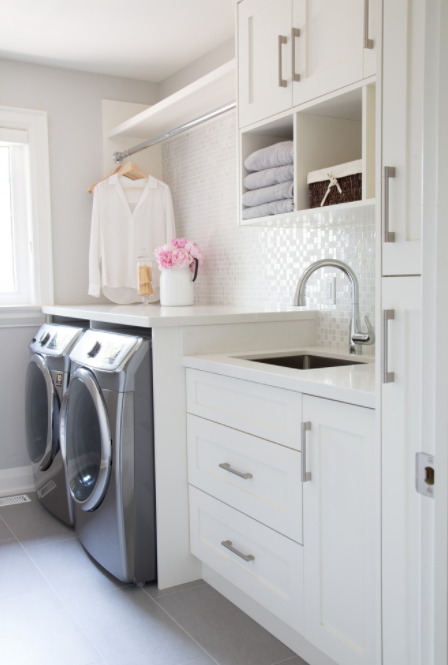 Image via Barlow Reid Design Inc.
With amenities like a sink, plenty of counter space for folding clothes, cabinets, and a rod for hanging shirts this laundry room packs a ton of functionality into a small space! Extra details like a tiled backsplash and decorative touches make it an inviting and attractive space to spend time. Pull-down drying racks mounted to the wall are a practical and efficient addition in this laundry room. Backing them with beadboard to match the rest of the room makes them look like they are an extension of the builtins. 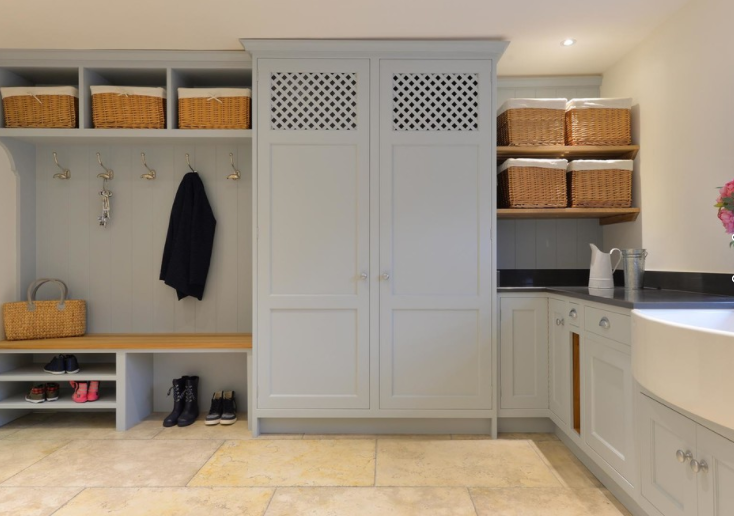 The washer and dryer hidden behind closed doors in this beautifully designed mudroom proves that you don’t need to dedicate an entire room to laundry. This space serves many purposes at once while still featuring plenty of style. 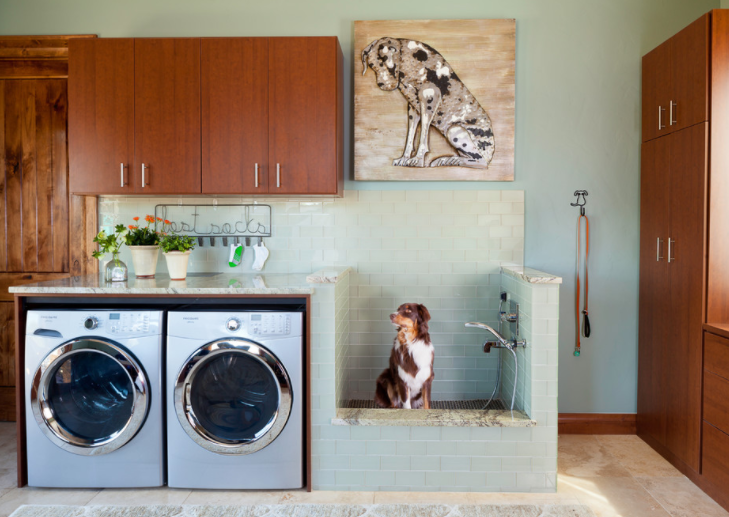 What dog owner wouldn’t love a dedicated pet washing station in their home? A laundry room is a great place to add a small shower to groom your furry friend. Say goodbye to pet hair over every surface of your bathroom and struggling to get them in and out of the tub. When you’re finished you can save yourself the trouble of carrying wet, fur-covered towels through your home, because the washer is just a few steps away! 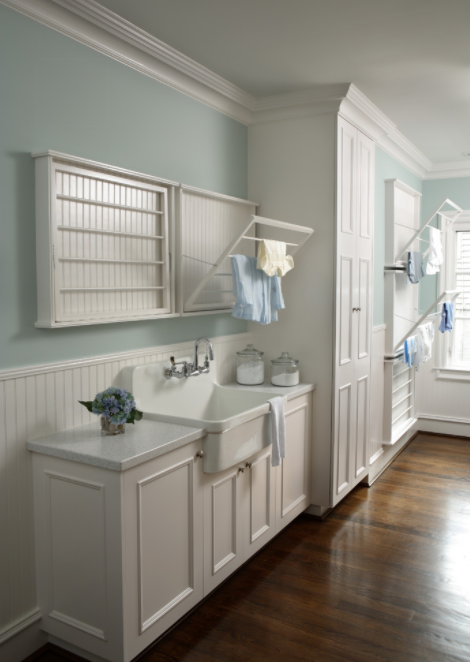 Ready to design the laundry room of your dreams? With extensive experience remodeling and building custom cabinetry for DC area homes we are here to help! Contact us today to learn more.